At Sugar Penguin Cakery, we add an extra touch of love into your celebration. Imagine a white round cake as your canvas. We create custom cakes inspired by your story and your ideas by bringing them to life using edible fondant art! Our passion for creativity has led to our love to bake cakes for you to love! 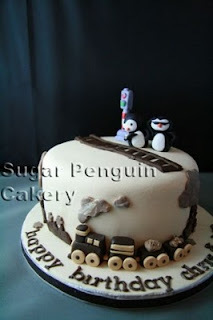 For full photo albums of ALL of our creations and feedback, visit and "LIKE" our Sugar Penguin Cakery page on Facebook! Follow us on Twitter @SugarPenguin for exciting updates and what we're up to. If you want more information, please email us at hello (at) sugarpenguin (dot) com!! So tell us your story and let's start baking! We had a request to make a custom birthday cake for two gentlemen, one loves trains and watches, the other one loves the outdoors, but both have the love for the penguins. Nothing excites me more than making those sugar penguins, after all, that's how we started! The challenge was that this is a "male" cake, so nothing flowery and pastel colors on the cake. The thing that came to mind was silhouttes. I ended creating designs based on silhouttes with monochromatic colors. 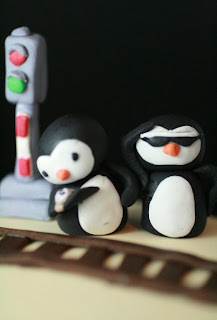 I chose the shades of brown while I kept all the gumpaste penguins and the train crossing light in colors and let them be the center of the attention. Bonnae helped me painstakingly cut and attached the train tracks out of chocolate fondant on the cake and cutting all details on the trees, bushes, and the billowing smokes.